But to my surprise, I’ve so far found it almost impossible to not have a really good time on the Tahoe. Given where I ski, the Tahoe’s waist width (96 mm) puts it firmly in the category where groomer performance matters. Moment calls it their “low tide go-to,” so that means it had better be serviceable on piste. On fairly soft groomers where setting an edge wasn’t too difficult, the Tahoe feels pretty snappy, at least for a ski of this width. It’s easy to set an edge and load the ski up, and the Tahoe finishes turns with a decent amount of energy. They’re not so powerful that I ever worried about getting high sided out of a turn, but they definitely have a nice pop to them. The Tahoe is plenty stable when making long, arcing carves, but it’s not a tremendous chore to flex them into shorter length carves. Of course, with its longer sidecut radius, the Tahoe isn’t really inclined to make extra short, slalom-style carves. That said, I also didn’t find them to be the type of ski that was heavily inclined toward super long carves; they were comfortable at speed, but I also had plenty of fun going at a much more reasonable pace, making mid-sized turns with the ski way up on its edges. On truly hard packed snow that I’d call icy (at least by western U.S. standards), I wasn’t that impressed with the Tahoe. It didn’t do anything horrendously unexpected, it just wasn’t inclined to really dig its edges in. Compared to something that’s a bit more of a dedicated carver, the Tahoe wasn’t nearly as much fun in these conditions. Part of the reason for that is, I think, Moment’s Triple Camber profile (which has camber underfoot, and pods of “micro camber” in front of and behind the binding). It seems like it doesn’t quite hook up as well in truly firm conditions when compared to a traditionally cambered ski. To be clear, the Exit World is a very different ski than the Tahoe, but to some extent, Paul’s findings are similar to my experience with the Tahoe—in firm snow, when the forward or rearward “pod” of camber breaks loose, it makes for a less predictable release than you would get on a traditionally cambered ski. I didn’t find this issue to be overly difficult to compensate for, but it meant that the Tahoe’s performance on legitimately firm snow doesn’t quite stack up against any number of other comparable skis. It’s also worth noting that I didn’t go through any efforts to put a particularly aggressive tune on the ski. They weren’t dull by any means, but I’m sure I could have eeked a bit more hard snow performance out of them with a file. But I think that would have negatively impacted the ski’s performance pretty much everywhere else—more on that below. 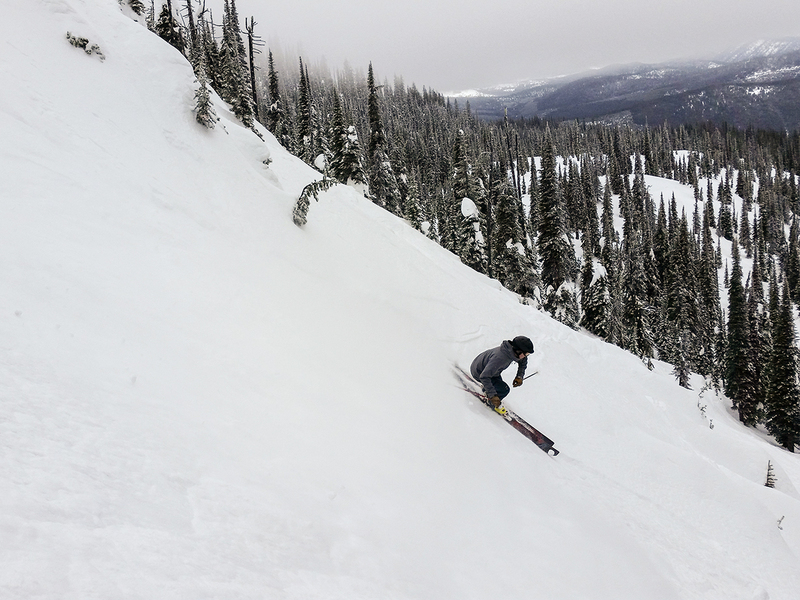 I’ll admit that Whitefish isn’t really the place to put a ski through the paces in bumps; we just don’t get particularly large or gnarly moguls. But in the bumps we do have, I really enjoyed the Tahoe. The wider sidecut radius keeps them from feeling hooky, the relatively light swing weight means quick movements won’t give you a hernia, and I found it really easy to transition between a longer turn on edge to a smeary turn to check speed or to deal with an errant mogul. All it takes is an intuitive, slight roll of the angles to engage or disengage the edges. At least to me, that’s the defining characteristic that made me like these skis: it is easy to make a ski that smears and releases easily, but it’s much harder to keep that trait alive in (1) a stiffer ski that (2) doesn’t have a bunch of rocker and (3) retains good grip on groomers. This is really where I thought Moment’s triple camber profile shines: you could probably get a little more grip on hardpack with a traditional camber profile (or at least make the ski more predictable when the edges start to release), and you could make the ski smearier with more rocker, but the triple camber offers 95% of both of those traits in one package. On top of all of that, the stiffer flex of the Tahoe means that carrying some speed through bumps doesn’t just result in the ski folding up; the Tahoe can handle being pushed hard without imploding. It also means that, at least by stiff-ski standards, the Tahoe has a nice pop to it. It feels much less glued to the ground and planky than some heavier, metal-infused skis. Most of the conditions I skied the Tahoe in were either soft, fresh (but not deep) snow, or full-on spring slushiness. And in these types of conditions, the Tahoe really felt in its element. It seemed happiest cruising around looking for little hits to pop off. And I found it to be easy enough to break loose that I thought it was a great ski in tight trees, but it is also stiff and straight enough that it’s comfortable going fast on open slopes. In super heavy, wet snow, I appreciated how easy it was to disengage the Tahoe’s edges—I felt like I could slide them around without getting that “ACL is about to pop” feeling. I’d still rather have a slightly wider ski in those particular conditions, but all in all, the Tahoe was better in grabby snow than most sub-100 mm skis I’ve been on. When jumping off of things, the stiff-ish tail and nominal tail rocker provide a solid landing platform. At least for someone of my weight (~155 lbs), it didn’t quite have the pop of a softer ski, but at least relative to the skis of a comparable stiffness that I’ve been on (which again, are primarily heavier skis with metal), I’d put it squarely in the “playful” category. I got all of one run on the Tahoe in legitimate, untracked powder. The snow was more Sierra Cement than Champagne Powder, but regardless, it was fresh. Noah Bodman on the Moment Tahoe, Whitefish Mountain Resort, MT. That aside, once it was up to speed, the Tahoe performed fine. Not great, but fine. If an intense snowstorm suddenly blows in and turns your morning of shredding groomers into an afternoon of chasing freshies, the Tahoe will be fine. Crud, as I’m using the term, means chundery refrozen junk. The kind of conditions where a stiff, damp ski does well primarily due to its ability to punch through heavy clumps of snow and smooth out the the chatter. This is where the Tahoe’s lighter weight and lack of metal shows. Its stiffer flex and straighter sidecut help it punch and slice through heavy clumps of snow fairly well, but at the end of the day, nothing really beats a heavy, damp ski in these conditions. I felt like the Tahoe got kicked around a bit more, and it doesn’t have that super damp stability of a true charger. I should note, however, that I spent plenty of time on the Tahoe in these conditions and I didn’t hate it. While they don’t have the damp stability of a heavy metal charger, they’re also not nearly as twitchy or deflection-prone as some of the lighter weight carbon skis. But ultimately, snow that has at least a little bit of give to it is where the Tahoe has been the most enjoyable. And perhaps that’s true for pretty much any ski, but in snow that is at least marginally soft and has some built-in suspension to it, I’d take the Tahoe over a heavier, damper ski. I think this is probably a large reason why I enjoyed the Tahoe a lot more than Will Brown or Jonathan Ellsworth did. They were skiing primarily on pretty hard, harsh windboard and variable conditions, where they snow was providing very little suspension and damping, while Whitefish (where I’ve been skiing the Tahoe) is kind of the opposite—it is a place where “bad” conditions often mean that it has maybe snowed a few inches over the past few days, but not enough to warrant bringing out fatter skis. The straight sidecut and stiff flex of the Moment Tahoe might give some people the wrong idea about this ski. For those looking for an all-out charger, the Tahoe isn’t quite heavy or damp enough to fill that niche. So if you’re just looking to go as straight and fast as possible, the Tahoe isn’t as stable as some other options. But if you like to ski fast but you still want something that’s a bit more playful, the Tahoe has a significant leg up on those chargier skis. Especially when the snow is at least somewhat soft, the Tahoe is a versatile ski that blends playfulness with stability better than any ski I’ve been on in the ~95mm-wide skis I’ve been on. For advanced skiers looking for an all around ski that’s fun in a wide variety of conditions, the Tahoe is worth a very close look. On a day that might include a bump run one lap, a run through the trees looking for things to jump off of the next lap, a quick groomer lap, and then some slushy spring skiing to round out the afternoon, I found the Tahoe to be a fantastic multi-tool. I really enjoy all of your posts from the guys and ladies on skis for my wife and I. What size would ya say for PB&J ? 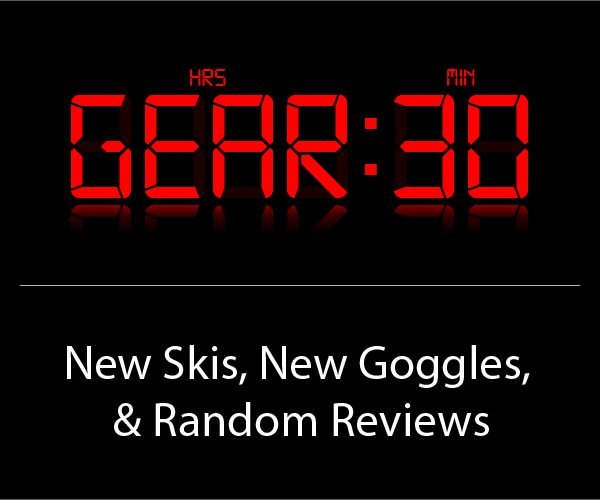 I just re read the Tahoe reviews by both authors and thought about what I want the ski to do and the actual benefits of the triple camber bringing in 95% of best of both woorlds in a stiff un rockered tail ski….ya get a little looseness w/o having to go soft or extra rocker which at my height and weight 5’10 210-215lbs makes sense. So I would look at Tahoe 186cm , PBJ maybe 188 seems long but if its Bibby’s little mustached brother maybe OK , Mantra 177 or 184 ??? I understand the Mantra and Tahoe are the stiffer of the 3 and they all have different rocker profiles….any ideas would be great. (1) For what you are describing, I think you would be fine with the 177 Mantra, and it feels like the *safest* recommendation here. (2) I would recommend the 188 cm length for the PB&J … but I’m not sure that the PB&J makes sense for your intended use? The PB&J has a lot of tip and tail rocker, so it isn’t going to hold or feel anything like your Motive 86, Salomon 8.0 (on the narrower end) or your new Belafonte (on the wider end). If you are okay with that, and you want a pretty loose 100mm ski that prefers a more neutral stance … then ok. But again, the 177 Mantra feels like a safer bet here? (3) It’s possible that you might really enjoy the 186 cm Tahoe, but if I had to bet on such things … see my first point. Sorry, I don’t feel like I’m yet able to boil everything down to the 1-ski best answer for you, but I hope this helps a little. And I’m happy to try to answer any follow up questions, so let me know! Yes my geeked out ramble was quite interesting with all of the ADD IPA induced rabbit holes…..there should be no drunk dialing or log in’s aloud after a designated time. I found a pair of Un used Nordica Hell and Backs 14/15 in a 185cm !!! I am really excited to ski them and may ski them this weekend at Mt.Hood .